A premium and professional food service solution, including a full range of extras listed within the specification tab below. 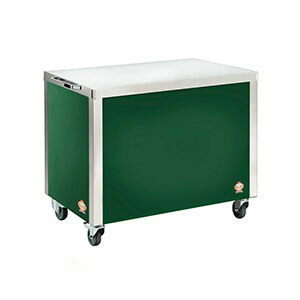 Mobile Trolley is a strong and portable foodservice solution which will provide a professional and flexible display for a wide variety of purposes. The unique construction of the Mobile Trolley ensures it is light and easy to manoeuvre whilst boasting a heavy load capacity and a massive 20 cu ft of interior storage space. 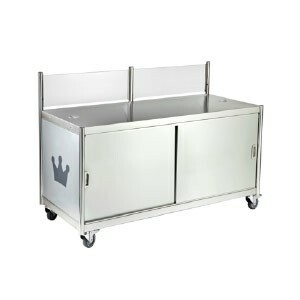 Its stainless steel structure and flat top design is very easy to clean, meets all your requirements for food hygiene. The standard version comes as a trolley with plain graphics board in a choice of 4 colours on 3 sides of the trolley, alternatively you can have your own logo or message printed on these boards for a small charge. Whichever boards you use they are easily interchangeable and will allow you to alter the look of your trolley according to its use. Perfect for using with a wide range of equipment we supply such as waffle making equipment, hot dogs or even roasting chestnuts. Quality Craftsmanship, built in the UK . 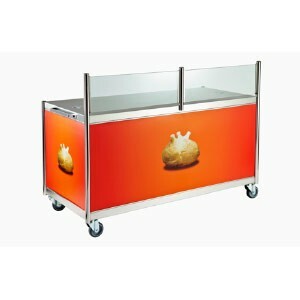 SKU: N/A Category: Mobile Trollies. A premium and professional food service solution, including a full range of extras listed within the specification tab. Rigid but modular stainless steel construction – for permanent looks without the restrictions. UK MODEL ONLY – The Mobile Trolley is only available to UK mainland customers. We regret it is not for sale in overseas markets or Ireland.